Organisations need to be adaptive and resilient if they are to survive and prosper. We have the experience and the tool kit to enable you to initiate, plan, implement and sustain the transformation of your business culture. The outcome of a change management programme is an organisation that can manage change by being resilient and adaptive. Change cannot be imposed; hearts and minds need to be won over. We follow a four stage process to bring about sustainable change. Initiation of change is often triggered by external events such as losing a major customer. Consensus for change needs to be built by gathering, analysing and sharing information relating to the internal and external environment. A culture audit would normally be completed at this stage. 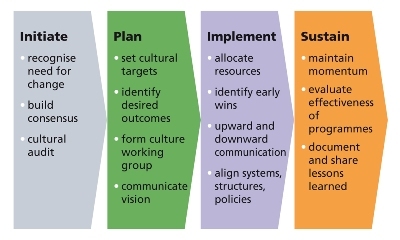 A plan for culture change includes the identification of levers for change, setting cultural targets and clear descriptions of outcomes. Mission, vision and values are developed or clarified. A diverse, credible culture working group steers the programme. Ongoing communication of the vision is crucial. Resources are allocated and plans refined; the programme is cascaded through the organisation. Systems, structures and policies are aligned; training is provided; upward and downward communication is established; early wins need to be identified. The culture working group meets regularly. Lessons learned are shared and documented. Energy and momentum has to be maintained; culture change processes are evaluated for effectiveness and mechanisms are established to maintain the gains realised. Let us help you avoid your change management programme becoming another failed statistic. We were able to transform the organisational culture from a stale, civil service-type culture to one where people were enabled to push boundaries and take responsibility. Mike gave us toolkits, approaches, coaching and guidance to achieve the results, improving organisational and leadership performance.